As many millennials in India, I was a software engineer who shifted my base frequently to take up new jobs (from Hyderabad to Bangalore, Delhi to Bangalore). Like many others, I was excited about the new opportunity but finding a new house and shifting to it made me nervous. Even after doing research and finding one, I was a victim of packers and movers tactics - Reasons lack of knowledge, my research was limited to the google’s first page. After hearing to the bunch of horrible stories regarding service standard provided by packers and movers, me and my co-founder decide to build the most trusted, highly transparent and standard marketplace for packers and movers services with technology as it core. We began our quest to find one answer. What's the right base price we need to pay for packers and movers services? Why it's important to get the answer? Since logistics industry is an old-age and high fragment market in India and most customers never experienced logistics services, don't know about the logistics cost, this gives an opportunity for the middle-men to manipulate prices, service quality, hook-up false promises to people to make their customers leaving behind the services promised. As a modern marketplace, compare & booking engine and full end-to-end service platform, it’s very important for Migrera to cut down all the noise to bring the right services and price to the customer bringing transparency and trust to choose from. Our initial quest lasted for 3 months. And over the year, our partnerships with many cheap, professional, branded movers and packers and working with them together for 2500+ moves. We have seen the good, bad and ugly side of the industry and learned many things. In this blog, we want to share our in-depth overview on how to distinguish different relocation service providers. Let’s take couple of case studies to understand the market better. Priya had to shift her 2BHK from “My Home Jewel” Miyapur Hyderabad to kondapur. She thought this would be a simple task and started searching for packers and movers online. The top searches are most probably the Top 5 or Top 10 websites or Agarwal or Leo. She called up 4 to 5 packers and movers service providers, gets 5 different quotes and confused to choose one when everyone promising the same services. This would be the situation of the many people who had experienced shifting or doing it so. Chances they don’t turn up on the move day Not customer oriented. Outsourcing to third party vendors on demand degrades quality. Srikant was excited about his new job in Bangalore. But, at the same time he was anxious about finding a home and shifting to Bangalore from Hyderabad. He had to talk to multiple packers and movers, ask them do the house survey and get the quotes. Each providing a different range of quotes and promising hell lot of things, how should he pick one? Usually, we go with the service provider who is in the budget, behaves well and promised things you need. But it might not be a wise decision without knowing the market standards and auditing the past performances of the movers. Let’s come to the point - Why there is a wide difference in quotations? Let's dig in how different vendors stack against each other. No pro in long haul moves. Does proper Survey Does proper survey. No on time guaranteed. No on time guaranteed. No on time guaranteed. They are not relocation service providers, they are just middle man with dummy company name. Have a presence in few cities but show the customers they provide services across India. sharing with Industrial goods truck.(Disastrous). Make you believe it's a household goods truck. No registrations or tax numbers. However, it is not always prudent to choose branded service providers. Sometimes it is too costly, sometimes one may not see professionalism in their working and sometimes same service is provided by professional packers and movers. But is not always easy to find the professional packers and movers, the customer has to put in a lot of efforts to make things happen. Migrera - The shifting hero who come to save Priya, Srikanth and many others. Migrera is not just an open marketplace to get you the quotes from different vendors and give to the customers to deal with and leave in between. Our experience says “Getting quotes is just 30% of the house shifting process. Think about the rest 70%”. We’re a modern booking engine and end to end service provider helping you right from — getting the best quotes from the most reliable services providers in the market, support on the move day co-ordination to post delivery and provide the customers with best in class support with any issues. 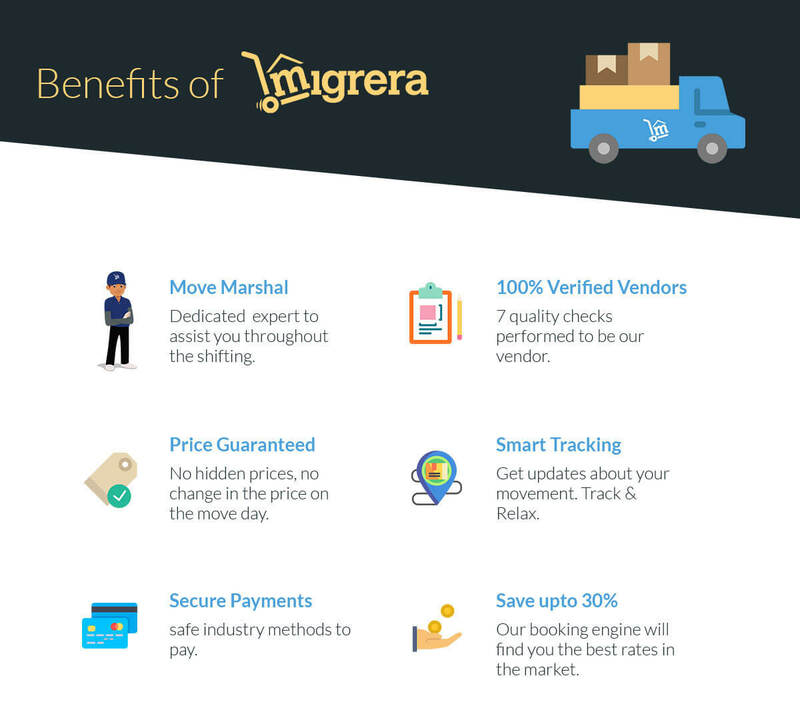 Migrera is a data enabled platform which find outs the market trends and service standard of the packers and movers to the different cities( New Delhi, Chennai, Pune, Bangalore, Jaipur, Mumbai, Hyderabad….) and bring the trusted, service quality and hand picked vendors for the each customer making the house shifting process more reliable and hassle free than any other platform.